Frostbeard Studio Book Lovers' Candles Seasonal Scents Now Available | Nerd Much? Frostbeard Studio has managed to combine two of my favorite things in the world – books and candles – and has now further improved upon that combination with holiday-themed scents. 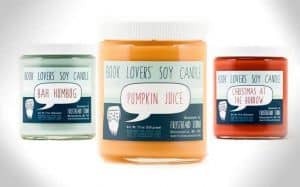 We’ve talked about these Book Lovers’ Soy Candles before, and we love them for several reasons: they are made from non-toxic, eco-friendly soy wax, contain lead-free cotton wicks, and come in sturdy, reusable glass jars. They come in many amazing book-related scents – I personally own Sherlock’s Study and love it – but these seasonal scents are perfect for getting you in the holiday spirit and would make amazing gifts for the bibliophiles in your life. Pumpkin Juice is pretty self-explanatory and is the perfect autumn fragrance; Christmas at the Burrow will evoke Mrs. Weasley’s baking with notes of sugar cooking, cinnamon, and vanilla; and for those of us who are less than enthusiastic about the holidays, Bah Humbug smells of blue spruce, fig, orange, pepper, and a hint of coal. Each jar measures about 4″ tall and 3″ in diameter, holds 8 fluid ounces of wax, and promises about 65 hours of burning time. That’s not bad for $18, considering you get a nice reusable jar and free shipping for orders of $50 or more. They also come soy tarts if you prefer a wax warmer to burning candles; you can get a package of six soy wax cubes for $6.75. The seasonal fragrances are only available for a limited time, so don’t miss out. For more cool stuff, stay tuned to Nerdmuch.com. Liz is a co-owner of Nerd Much. She is a feminist, nurse, freelance writer, blogger, foodie, bookworm, gamer chick, craft beer snob, coffee addict, chocoholic, Hufflepuff, sci-fi/fantasy junkie, and mom.